Mike McCormack, Solar Bones, Tramp Press, 2016. Once a year, on All Souls Day, it is said that the dead may return; Solar Bones tells the story of one such visit. Set in the west of Ireland as the recession is about to strike, this novel is a portrait of one man's experience when his world threatens to fall apart. Wry and poignant, Solar Bones is an intimate portrayal of one family, capturing how careless decisions ripple out into waves, and how our morals are challenged in small ways every day. The bell is the Angelus bell, ringing out in rural Ireland – in Louisburgh, near Westport, Co Mayo, “a county with a unique history of people starving and mortifying themselves for higher causes and principles [...] blistered with shrines and grottoes and prayer-houses and hermitages [...] a bordered realm of penance and atonement...”. It continues as prose, but without any full stops or full sentences. 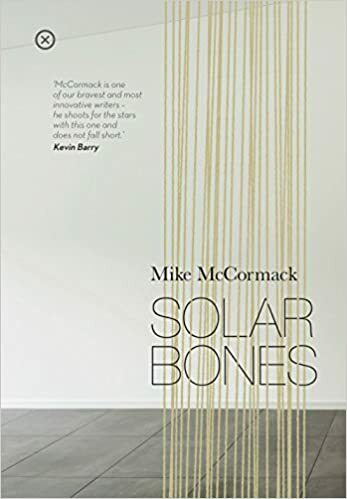 One of the judges, Prof Blake Morrison, said: “Set over a few hours in a single day, and told in the first- person voice of a middle-aged engineer, Mike McCormack’s Solar Bones transcends these seeming limits magnificently. Solar Bones focuses on Marcus Conway, a fifty-something year old engineer from a small town in County Mayo. On 2nd November, All Souls Day, he sits in his kitchen listening to the Angelus bell. He opens the paper and starts to read, with the stories recalling memories from his past. We come to get to know Marcus as he reflects on his life, his marriage, his children and his job. But this is not a typical story about a man ruminating on the events of his life. Written as a stream-of-consciousness narrative, there are no full-stops and little punctuation for the entire 223 pages. Sentences run into each other as he drifts from thought to thought and jumps through different time periods in his life and back again. This might sound daunting but don’t let it put you off. It might take a few pages, but once you get into the rhythm of the story it becomes easy to read. It’s Mike McCormack’s skillful writing that makes Solar Bones as readable as it is, despite its difficulties on the surface. It’s lyrical and poetic, and flows easily, connecting each of Marcus’s thoughts and memories seamlessly, from his daughter’s art exhibition, to his wife’s illness, and his troubles with work. None of the thoughts are linear, but it’s not jarring for McCormack to pull you between years as Marcus reminisces. Solar Bones comments on a lot of different aspects of life. The politics of a small town, modern art and protest, and the situation in Ireland soon after the recession hit. But most of all this is a book about domesticity and family life. It’s the parts of the story where Marcus thinks about his wife and his children that will stay with you the longest. There is such love and care when it comes to his family that it’s difficult not to feel for Marcus. He is a strong character, and well written. His relationship with his children is one that many people can relate to; not understanding why his children do what they do, but supporting them nonetheless, with only a small amount of reproach.